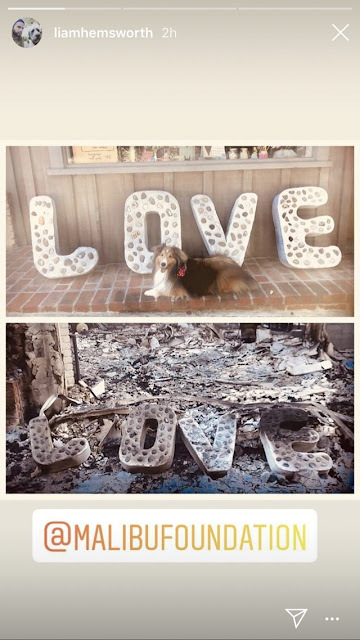 Miley Cyrus and fiancé Liam Hemsworth are among those who lost their homes to the Woolsey Fire in Malibu last week but that didn't stop them from donating $500,000 to the victims. Cyrus announced the news on Twitter earlier this week, and have since been advocating for more people to join in and donate. In a statement to the AP, Cyrus's rep said that “Miley and Liam lost their home but are very grateful to be safe along with their animals! Their community and state are very special to them and they want to give back to the place that has created so many beautiful memories for themselves and others." “These funds will be used for those in financial need, emergency relief assistance, community rebuilding, wildfire prevention and climate change resilience,” the statement continued. Earlier, Hemsworth showed the before and after of their own home, while tagging the Malibu Foundation in several Instagram posts to encourage his fans to donate as well.